Who can jump higher or find their way through the obstacle course first; the kids or the parents? Find out at our next Family Jump Time. 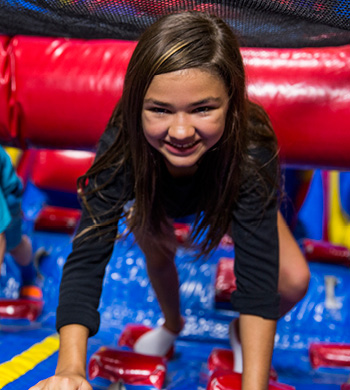 Bring the family to Pump It Up for a fun time for all, meet new friends and bounce, slide and imagine. Pump It Up is a safe, fun, clean and climate controlled environment that’s fun for all ages. *Reservations are not required but are recommended. *Safety waivers and socks are required in order to jump. *Parent's must stay with their children in the arenas and are responsible for watching them. **Please check our calendar for cancellations, altered open jump times, or bonus open jumps!